These are deliriously happy feet. These are feet that just a few minutes ago ran a couple of miles of rocky trail and feel like they've had a meticulous and loving massage. These are feet in the New Balance 100 trail shoe. It's possible that running in a super-lightweight, minimalist shoe will set me up for injuries I would never anticipate, blah blah blah. One short run isn't a reliable test, blah further blah. See, I love my feet. I love my feet the way some people love their cars or paintings they own. I love my feet the way I love childhood friends. It makes me happy when my feet feel good. And my feet (and legs, and problematic L4/L5 vertebrae) felt great after this little run. The New Balance 100 sole has plenty of grip but lets me feel how the foot moves against the ground. Even with the rock plate in the forefoot, my toes were flexing to grip as I was running. No ankle twist threat missteps today, so the lateral support test is still to come. Comfy upper, no distracting seams and no fat cushion in the tongue. The back of the shoe angles forward steeply — helpful for my narrow heel, but I'll have to watch out for the little wear patch that always forms in the middle of the ankle collar. The 100 runs true to size in length. It's snug, even slipper-like; I use all the eyelets to prevent heel slosh, and it was a little tricky to get the laces loose enough for comfort. If you have wide feet, try on some New Balance neutral B widths to see if they'll work for you before ordering your 100s. 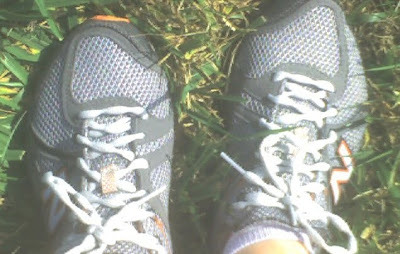 I've never worn a shoe that so encourages a running step — it was practically rolling me forward off my toes. The circles in the soles do hang onto tacky trail soil the way a biscuit cutter hangs onto a biscuit. I didn't mean to bring any of the Violet trail home with me, but it happened. And I hope the fabric is sturdy enough not to rip. It seems improbable that this gossamer shoe will also prove durable. High hopes here. A word about the shoes I leave behind. Adidas shoes have served me well — those folks understand the narrow foot. My favorite pair of road shoes so far were the Adidas Response Light 4s, a training flat, bought before I heard you weren't supposed to run your base miles in the lightest shoe possible. Anyway, faced this fall with the choice of running trails in my Boston Classics with their relative lack of lateral support, not running trails as soon as possible, and crossing my fingers and buying an Adidas stability shoe (on deep discount, mind you) — well, what choice is that, really. I and my neutral feet came home with the Supernova Riot. And I have been apologizing to my feet ever since. I'm sorry, feet. I'm sorry, hips, spine, and knees, for correcting a problem the feet didn't have. I think it was hard on you. Lately on dirt you all have been fractious and uncooperative with one another, and today you lined up like beads hanging on a string. Perhaps when I'm a stronger runner I won't care as much what shoe I'm in. Perhaps I overblame or overcredit the equipment for today's comfortable run. Perhaps the advantage was all in my mind. I'll still take it. Today, I wasn't forced to pay as much attention to my footsteps, so I noticed some very interesting things about trail running. I'll share them with you tomorrow, because right now I have to sleep — I'm running with Zip at 6 AM and need high energy.